Summary: When a car accident leaves the lives of best friends Callie and Ivy in jeopardy, Kurt and his friend Xander rush to the hospital to find out their fates. As the background of the story behind the accident slowly unravels from three different perspectives, the complicated nature of Callie and Ivy’s friendship reveals itself. Callie seems to be the only one who is happy about Ivy’s return to town, but their connection causes problems with Callie’s parents as her mom forbids Callie to see her. Drawn to Ivy’s electric nature, Callie ventures down a road of self-discovery with unforeseen and permanent consequences for herself and others. 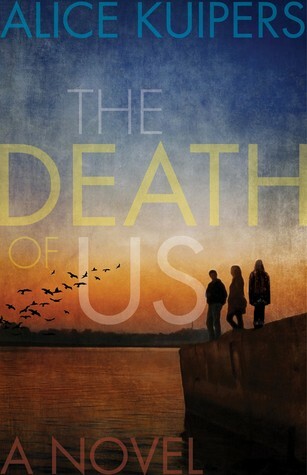 Review: Exploring themes of identity, friendship, trust and self-esteem, The Death of Us by Alice Kuipers is a suspenseful tale presented from the perspectives of three different characters moving back and forth from before and after the accident. Kuipers is kind to her readers and clearly labels her time periods and perspectives, and as a result her choice of narration ends up being unique and multifaceted instead of cumbersome. Suspense is a delicate story tool. Too little and a reader’s interest can lag, too much and a reader can become frustrated. Kuipers, however, wields it with considerable skill, keeping her reader on the hook and wanting more. By beginning the story with the accident, my interest was immediately piqued, and by the time I had learned how exactly everything came about, who was involved and who survived, I was involved in the characters’ lives and felt the true impact of the situation. I only have three memorable quotes because with a story like this it is very important not to accidentally reveal key surprise plot points. Instead I picked the first as a telling character description, the second as simply a vivid and beautiful piece of writing, and the third as a life truth I could relate to. While the mystery of who, if anyone, will survive the accident is the driving force of the story, I loved the aspect of Callie coming into her own and gaining the confidence to be herself in who she loves and in what she writes. Kuipers writes Callie’s parents as people who genuinely seek her best interests, which ends up being a stark contrast to Ivy’s mother and Kurt’s birth mother. Callie herself is a genuine character in the process of learning from her mistakes. I liked the sub-plot about Rebecca being hurt and miffed as Callie’s best friend when Ivy comes back to town, because Callie’s obsession with Ivy is all-consuming and others can see it. Ivy is complex and complicated. Lacking support from her mother who drinks and deals with depression, she’s desperately searching for something to hold on to and get her through. But that keeps changing. After her break up with Diego, she turns to motivational videos, Callie, alcohol and Kurt, rotating through her crutches without dealing with the real issues of being abandoned by her father and having a suicidal mother. I felt for her because she was trying so hard to keep up her façade of having everything under control. She’s magnetic and sparkles with life, and it’s easy to see why others are attracted to her. But my favourite character ends up being Kurt. A year older than the rest, he’s had his share of trouble in life with his father dying of cancer and his birth mother turning to substance abuse to cope. He’s a thoughtful character, and Kuipers shows this by writing a particularly poignant scene shared by Kurt and his mother wherein Kurt sees his potential future staring back at him and decides to make a different decision. If you pick up The Death of Us, make sure you have some time because you’ll need some serious willpower to not read it all in one sitting. Also, keep the tissues handy – you’ll need them. The Death of Us by Alice Kuipers, is published by HarperTrophy Canada, (2014).